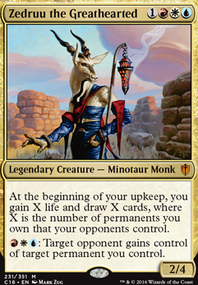 bushido_man96 as for Amulet of Vigor yes your absolutely right i did only put in there to speed up my tap lands but with 12 pure Taplands Temple of Silence , Sandsteppe Citadel , Rakdos Carnarium , Orzhov Basilica , Opulent Palace , Nomad Outpost , Izzet Boilerworks , Gruul Turf , Golgari Rot Farm , Dimir Aqueduct , Boros Garrison and Azorius Chancery , and 6 ETB tap unless lands Blood Crypt , Godless Shrine , Isolated Chapel , Overgrown Tomb , Sacred Foundry and Watery Grave think me having Amulet of Vigor is justified. 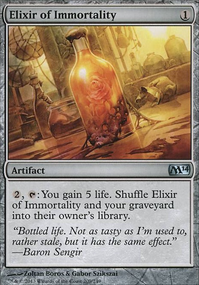 There are actually 4 effects that care about number of artifacts, Inventors' Fair , and I dropped Boros Garrison completely because it was slowing down the deck, and while I enjoy the card immensely because of art and it feels fantastic when you are able to replay the land next turn and untap with it, it's just not worth wasting an entire turn in the early game. I would recommend adding some more low end ramp - Knight of the White Orchid , Fellwar Stone and Mind Stone are all good options. 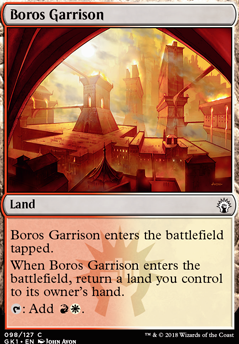 I would also replace Boros Garrison , Great Furnace and Ancient Den with better lands. The artifact lands don't bring enough value to offset how fragile they are and garrison is just really slow. This deck could use some more ramp, card draw, and lands. Also you have two cards too many in the list so that's a slight problem too. Some cards to cut would be Sun Titan, Burning of Xinye, Elspeth, Sun's Champion, Great Furnace (It's strictly worse than a basic Mountain in this build as it dies to artifact removal and you have no synergy with it) and kinda Chance for Glory and Hostility. Sun Titan only returns permanents and most of your deck is instants and sorceries. I really don't think you want to destroy and of your own lands so the Burning is pretty bad. 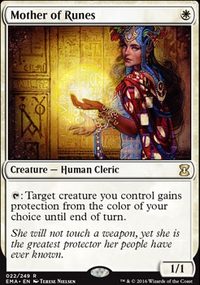 You have enough board wipe effects that also synergize with your commander and you don't have much of a token strategy going on so Elspeth seems pretty out of place. I suppose she's a potential alternate win-con, but most your deck has the ability to win off of any number of top-decks late in the game. I see how Chance for Glory is tempting, but it seems like a really niche card and I think I would rather have card draw in its place. Hostility is the card I'd like to see in action before really making a decision on. 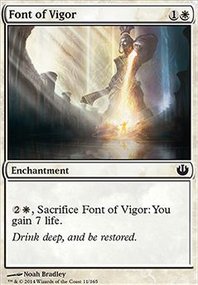 I feel like it could often just be a dead card because you'll want to be dishing out lots of damage and gaining lots of life with Firesong and Sunspeaker on the field, but I suppose it's another alternate win-con that synergizes with the deck. I would think about adding Fateful Showdown and Khorvath's Fury since they draw cards and deal damage. Also, Magus of the Wheel if you can get your hands on one. Really and effect that either deals damage or draws more cards than you discard when you discard. Plus wheel effects are good for disrupting opponent's strategy. Rocks that draw cards like Hedron Archive, Dreamstone Hedron and Commander's Sphere are also good ideas. I would cut the Vivids in favor of Wind-Scarred Crag and Boros Garrison or any other W/R dual land (Clifftop Retreat, Inspiring Vantage, Sacred Foundry, etc.). Then add at least two more lands. In sum, get down to 100 cards, add more lands, ramp, and draw spells.